Your marketing materials are your showcase to the world. Prospective customers get their first impression of your company from your leaflets, brochures, posters, flyers, advertisements, press releases, advertorials, website, and exhibition stands and booths. So why take the risk of looking slapdash with a careless translation? Generally speaking, the more creativity you put into your material, the more creativity it will take to translate it. In the case of marketing materials, rather than a translation, you need a transcreation: the message needs to be transformed into an English version that evokes the same feelings and mental pictures as the original Italian text. Do not just rely on luck: give the task to a professional native English speaker who has the qualifications and experience to do the job properly. 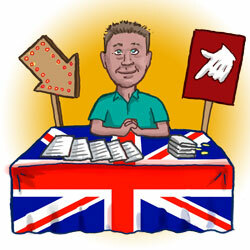 Then, once you have translated all your material, if you need someone to lend a hand with presenting your products in English at your stand in the same rousing fashion, do not hesitate to contact me.